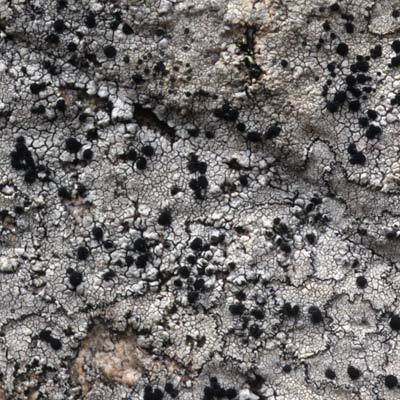 This is a common crustose lichen of siliceous maritime rocks. It can form tremendous colonies with sea-ivory, Ramalina siliquosa (described elsewhere) along exposed sea cliffs. The finely cracked, white to grey thallus bordered by a black line, supports abundant black discs (to 1.5mm diam.) with a conspicuous white-frosted margin. Spores are one-septate. Spot tests: K+ yellow-red, Pd+ yellow. Throughout Ireland. Reacts K+ yellow-red, C-, Pd+ yellow. Simms, M. J., (2016). Buellia subdisciformis (Leight.) Jatta. [In] LichenIreland.